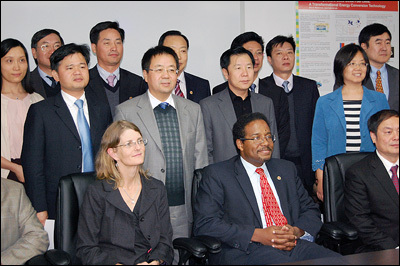 Professor Sheryl Ehrman (front row, left), Dean Darryll Pines (front center), and Associate Professor Chunsheng Wang (center, in light grey jacket) at the signing of the Memorandum of Understanding between Huizhou Eve Energy and the University of Maryland. University of Maryland Associate Professor Chunsheng Wang (Department of Chemical and Biomolecular Engineering [ChBE] and University of Maryland Energy Research Center [UMERC]) has signed a two-year research and development agreement with Huizhou Eve Energy, one of China’s largest companies and its most prominent battery manufacturer. Wang and his research group will work to perfect a novel process that will be used to improve the company’s lithium-ion and sodium-ion batteries. The ultimate goal, says Wang, is to create smaller batteries with higher power densities and long shelf lives. Eve Energy is headquartered in Huizhou, Guangdon Provence, China. Huizhou is a designated Zhonghai National High-Tech Zone, and is considered to be among the country’s most livable and beautiful cities. It is also the home to China’s top electronics brands and the Chinese offices of many Fortune 500 companies, such as Coca Cola, Sony, and Siemens. The event was attended by a delegation of Huizhou City officials, including its mayor, Jiaomeng Mai; a Maryland delegation including Wang, Clark School Dean Darryll Pines, ChBE Professor and Chair Sheryl Ehrman, UMERC Director Eric Wachsman, and members of the university’s Office of Research and Association of Chinese-American Professors & Scientists. Also in attendance were representatives from the National Council of Chinese Americans (NCCA) in Washington, D.C., who introduced Eve Energy to Wang through its Zhongkai Overseas R&D Program. The program helps companies in the High-Tech Zone establish relationships with targeted labs in the United States to facilitate joint research, technology transfer, commercialization, marketing, and investment. Mr. John Wu, VP North America, Huizhou Eve Energy Co. Ltd.
Dr. Phillip Chen, Director, NCCA Center for Education Science & Technology and Zhongkai Overseas Liaison Office.